We had no lucking finding lobsters, but had the most amazing full moon. The next day still determined to find lobster we took the dingy out to a small rocky island. Nothing yet again. 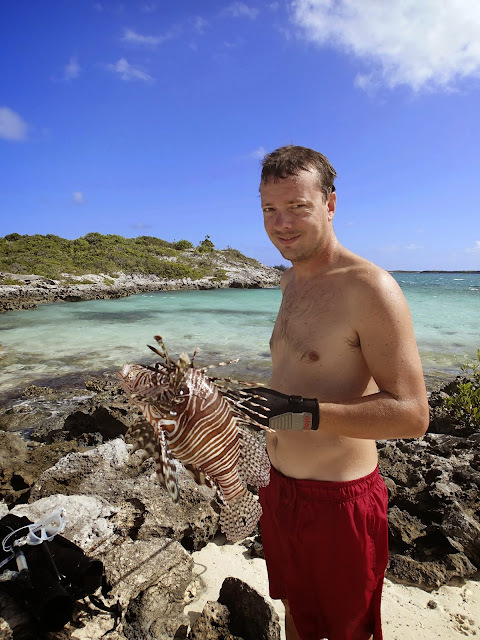 Although Preston was able to use his brand new spear on a huge lionfish! Another one down, now only 10 million to go. We gave up on the lobster hunt for now and moved down the Staniel Cay, 5 miles south. Perfect hour of sailing and this time we pulled into the anchorage with the sails down determined not to bump into one of our neighbors. I don’t think our insurance covers multi-million dollar yachts. This is a very popular anchorage and it is true that we will be sharing our backyard the next few years with everyone from billionaires to people living “off the land”. We had dinner over on a new friends boat last week at Norman’s Cay and ended up passing them on our way to Staniel Cay. We talked over the radio for a while and the next time we run into them I owe them a loaf of bread, because their oven doesn’t get hotter than 300 degrees. Anyway back to Staniel Cay. IT IS AMAZING!!!! We are tucked into a well-protected bay with a sandy bottom, which means the anchor holds very well. Who's full moon was it? Holy cats that lion fish is HUGE! I didn't know they could get that big. And just so you know...you are WAY too close to that shark for my comfort. Can you even believe how big that lion fish was? I still can't get over it. Most of the ones we see are tiny. Tell Charlie that Preston loves to swim with the sharks and so far they have been really nice. Lets hope they continue to be friendly.